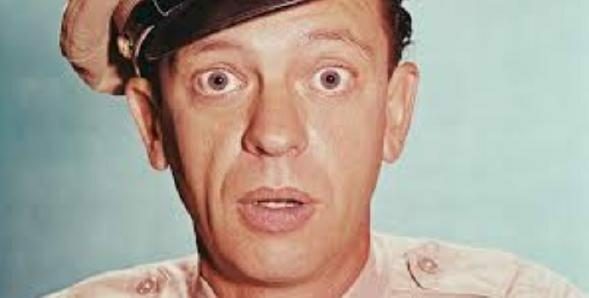 FACT CHECK: Don Knotts — Marine Drill Instructor? Don Knotts — Marine Drill Instructor? Claim: Actor Don Knotts once served as a drill instructor for the U.S. Marine Corps. I heard that Don Knotts was the most feared drill instructor on Parris Island during World War II. landlord Ralph Furley on Three’s Company, as not just the unlikeliest serviceman since Gomer Pyle, but as the toughest and most fearsome of all military figures: a U.S. Marine Corps drill instructor. Barney Fife eventually won him five consecutive Emmy awards for Best Supporting Actor in a television series.) Don Knotts also had one other military connection of the cinematic variety: he played the character of Corporal John C. Brown in stage and film versions of No Time for Sergeants. Why so many rumors about entertainers as military figures? The prevalence of this legend type can probably be attributed to the appeal of imagining popular stars as the polar opposites of their on-stage personas: Just as we’re intrigued by the notion that macabre rocker Marilyn Manson once portrayed the geeky Paul Pfeiffer character on TV’s The Wonder Years, so we’re fascinated with the notion that a slight, skinny man best known for playing a series of fumbling, high-strung, nervous characters was once one of World War II’s “most feared drill instructors.” Legends like these confirm the belief that we never know what improbable paths life might lead us down and that appearances can be deceiving. Knotts, Don. Barney Fife and Other Characters I Have Known. New York: Berkley Boulevard Books, 1999. ISBN 0-425-17159-0.